12-inch scale resin statue of Adam West as Batman! Based on the classic 1966 Batman TV series. The base shows the memorable "Pow!" graphic! Limited edition of 1,966 pieces. Holy left cross, Batman! This 12-inch scale resin statue of Adam West as Batman is based on his appearance in the classic 1966 Batman TV series. Our hero is depicted throwing a massive punch at one of his numerous foes or their underlings, and the base even provides the "Pow!!" sound effect that showed up on screen in every fight! 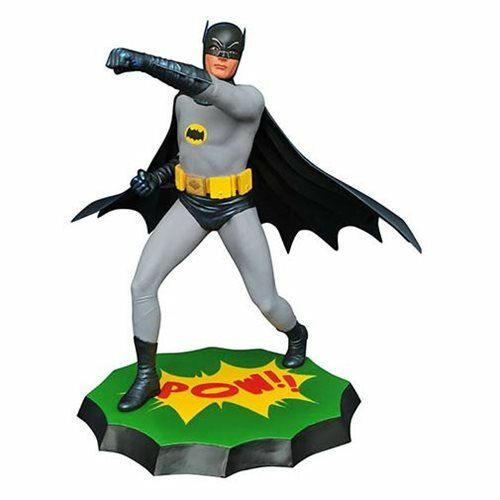 With detailed paint applications and limited to only 1,966 pieces, this Batman 1966 TV Series Premier Collection Statue comes packaged in a full-color box with a certificate of authenticity. Ages 13 and up.